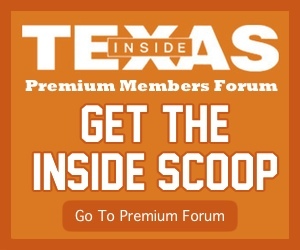 AUSTIN – The Texas Longhorns had a simple task facing them Wednesday night at the Frank Erwin Center: beat Baylor. In a league and a season devoid of a dominant hoops team, this did not seem to be an unattainable goal despite the fact that the Bears entered the game tied for first place in the Big 12. And much to the relief of the at least somewhat beleaguered Texas coach Shaka Smart, his sometimes promising and often exasperating team accomplished their goal by beating the Bears 84-72. The win bumps Texas to a 5-5 record in league play and 13-10 overall. Baylor falls to 6-3 in the Big 12 and 15-7 overall. 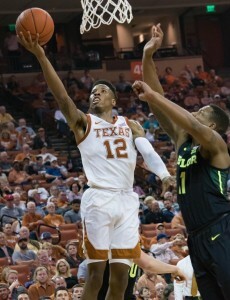 Kerwin Roach led the Longhorns in scoring with 21 points, hitting seven of nine shots from the field. Matt Coleman finished with 18 points, Jaxson Hayes had 12 and Courtney Ramey rounded out the double-digit scoring for Texas with 10. Smart said his team knew of Baylor’s impressive streak coming into the game. Baylor coach Scott Drew was certainly impressed by the Longhorns. The Longhorns were effective throughout the game on offense, and finished the game shooting 55 percent from the field, hitting 8 of 20 shots from beyond the three-point line. Dylan Osetkowski’s line included nine points and seven rebounds. The Longhorns started fast in the first half, quickly building a 9-4 lead on a pair of Hayes bunnies, a Coleman three-pointer and a Roach layup. After Baylor’s Mark Vital hit a short jump shot, Dylan Osetkowski pushed the Texas lead on a short jump-hook in the lane and a layup. He followed that with four more quick interior points, Roach sank a pair of free throws and Texas led 15-6. The Bears cut the lead to 15-11 on a Mario Kegler layup, but Texas quickly upped that lead to 23-11 with six points from Ramey and a pair of Osetkowski free throws. Baylor ultimately clipped that lead to 28-22 on a driving layup by Jared Butler, but Texas again answered, this time with five straight points to put the Longhorn advantage to 33-22. Baylor’s Flo Thamba made a layup to trim the Texas lead to 37-29, but a Roach four-point play, a Coleman layup and a Roach runner off the glass with 1:40 left in the first half gave Texas a 45-29 lead. The Longhorns led 45-30 at halftime. The second half was downright pedestrian: the Bears offense started the game cold – the Bears shot just 42 percent in the first half – and never made a serious push. Baylor’s Butler described the game most succinctly. And accurately. The Longhorns’ next game is Saturday on the road to West Virginia.